I am thrilled to announce that Inside will be screening alongside a variety of other horrific shorts at The Blood In The Snow Canadian Film Festival! 'The Beard' Nominated for a Golden Sheaf Award! I am pleased to announce that The Beard has been nominated by the Yorkton Film Festival for it's 2012 Gold Sheaf Awards under the Drama category! Here’s a look at some storyboard art created by the one and only Dave Knox during the early pre-production stages of Inside. While applying to several different art councils for funds, I wanted to submit some visual references of key plot points and visually-driven segments derived from the script to convey the scope of the project. I find that visual references (assuming they are being requested, of course), go a long way in strengthening a grant application. After all, film is first and foremost a visual medium. I approached Dave with the idea and provided him with the script and (very) basic sketches conveying what I was looking for. He took my stick-figured illustrations and ran with it. 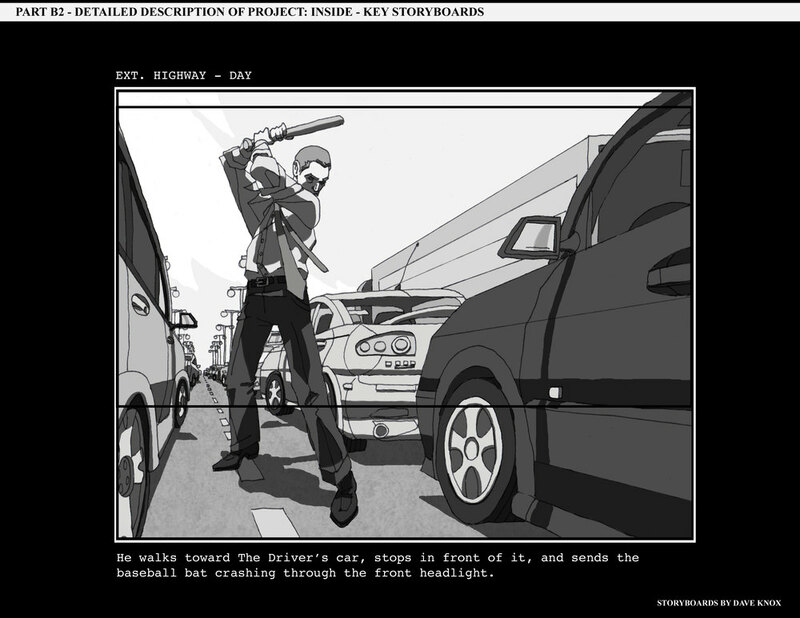 Check out the storyboards below - you can click on them to view the full-scaled versions. I believe Dave drew these out in pencil, scanned them and shaded them digitally. Needless to say, some of the scenes depicted in the drawings above were changed heavily during production due to budgetary constraints... But oh how badly did I want the opportunity to destroy a car on the highway with a baseball bat during rush-hour. Anyway, we made the best of what we had. Do yourself a favour and check out some of Dave's other work here and here. He's awesome and he's making a video game (see 'he's awesome'). Oh yeah, 'Like' him here. 'Inside' Screening - Fangoria's Fright Nights at the Projection Booth! I'm happy to announce that Inside will be screening this coming Saturday, February 11th, 2012 at the Projection Booth in Toronto. 'Inside' Featured as part of the NSI Online Short Film Festival! This week NSI Online Short Film Festival is officially featuring what is admitedly one of my most ambitious short films to date, Inside.